A celebration of all things unicorn! Rare and majestic, unicorns are powerful, graceful, and mysterious. The Magic of Unicorns is a beautifully illustrated celebration of these peaceful mythological creatures. 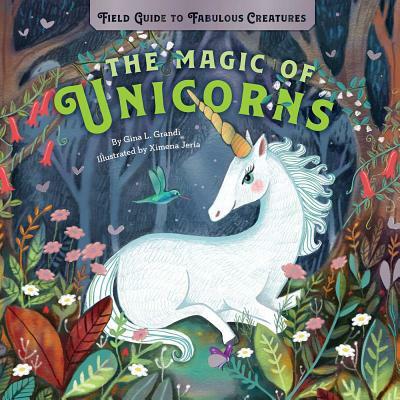 Part field guide, part folklore, this charming book includes traditional tales of unicorns helping lost princesses, dazzling images of unicorns from around the world, and lots of information about what they eat, where they live, and which magical powers they have. Plus, readers will get tips for spotting unicorns today! Gina L. Grandi is a professor and author with a (totally healthy) obsession with mythological creatures and their magical, mystical powers. A shy child, Ximena Jeria grew up expressing herself through illustration. She studied graphic design at the University of Valparaiso, Chile, and has worked for many publishers and design agencies both in Chile and abroad. Ximena lives in Vina del Mar, Chile, with her husband and children.